North Korean leader holds historic summit with South Korean President Moon Jae-in. 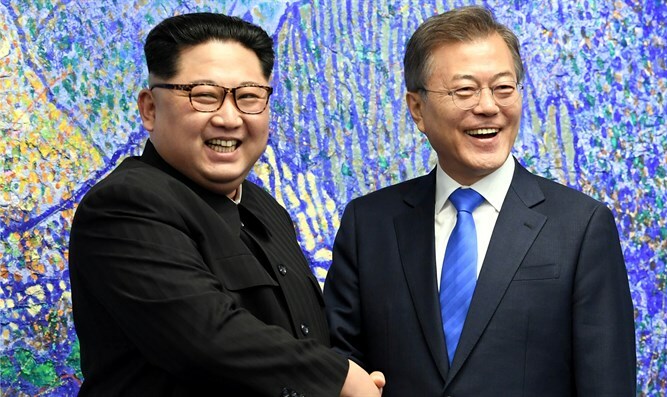 North Korean leader Kim Jong Un on Thursday night headed for the Demilitarized Zone for a historic summit with South Korean President Moon Jae-in in the strip of land that divides their countries, AFP reported. The meeting on the southern side of the truce village of Panmunjom, only the third of its kind since the end of the 1950-53 Korean War, will be the highest-level encounter yet between the two countries, and is intended to pave the way for a much-anticipated encounter between Kim and U.S. President Donald Trump. In the most detailed direct reference to the process by the North so far, Pyongyang's official KCNA news agency said Kim will "open-heartedly discuss... all the issues arising in improving inter-Korean relations and achieving peace, prosperity and reunification of the Korean peninsula." Moon greeted Kim at the concrete blocks that mark the border between the two Koreas in the Demilitarized Zone to begin the rare meeting. When Kim stepped over the line he became the first North Korean leader to set foot in the South since the Korean War ended 65 years ago. The White House welcomed the Moon-Kim meeting. “On the occasion of Republic of Korea President Moon Jae-in’s historic meeting with North Korean leader Kim Jong Un, we wish the Korean people well. We are hopeful that talks will achieve progress toward a future of peace and prosperity for the entire Korean Peninsula. The United States appreciates the close coordination with our ally, the Republic of Korea, and looks forward to continuing robust discussions in preparation for the planned meeting between President Donald J. Trump and Kim Jong Un in the coming weeks," it said in a statement. Trump in March unexpectedly agreed to a meeting with Kim, to be held by the end of May. Kim later acknowledged for the first time his country’s contacts with the United States. U.S. officials recently said North Korea had directly confirmed that Kim was willing to negotiate about potential denuclearization. Last week, Kim himself announced that his country would close its nuclear test site and suspend long-range missile tests. Last year, Pyongyang carried out its sixth nuclear test, by far its most powerful to date, and launched missiles capable of reaching the U.S. mainland. Those actions sent tensions soaring as Kim and Trump traded personal insults and threats of war. Administration officials said this week that Trump will urge North Korea to act quickly to dismantle its nuclear arsenal when he meets Kim and is not willing to grant Pyongyang substantial sanctions relief in return for a freeze of its nuclear and missile tests. Trump reiterated on Tuesday that he would walk away from the talks with North Korea if they are not fruitful. "Unlike past administrations, I will leave the table," he said. "But I think we have the chance to do something very special."